Today you can find a ton of information to help you build a website. It’s becoming more and more accessible for the non-coder, with plenty of options to choose from. The reason why WordPress has become the most popular CMS platform is because of the well designed interface and ease of use. Set-up is quick and there are an abundance of plugins and added features to choose from. So if you have decided to design your website with no help from a website designer, WordPress is your best option for free website templates. Features like bootstrap, testimonial sliders, service blocks, media galleries and parallax slider come with most free websites. Many have different layouts to choose from and multi sidebar options. And because it’s the most popular you will find plenty of resources to help you design the ideal site for you. But with all that said not all themes are built the same. We’ve eliminated the research process and compiled our list of 10 Free Multi-Purpose Themes. They are versatile and fluid across many industries. So, if you’re an interior designer, small business owner, blogger, or store owner any of the themes listed below will work for your business. So this weeks list is all about versatility. 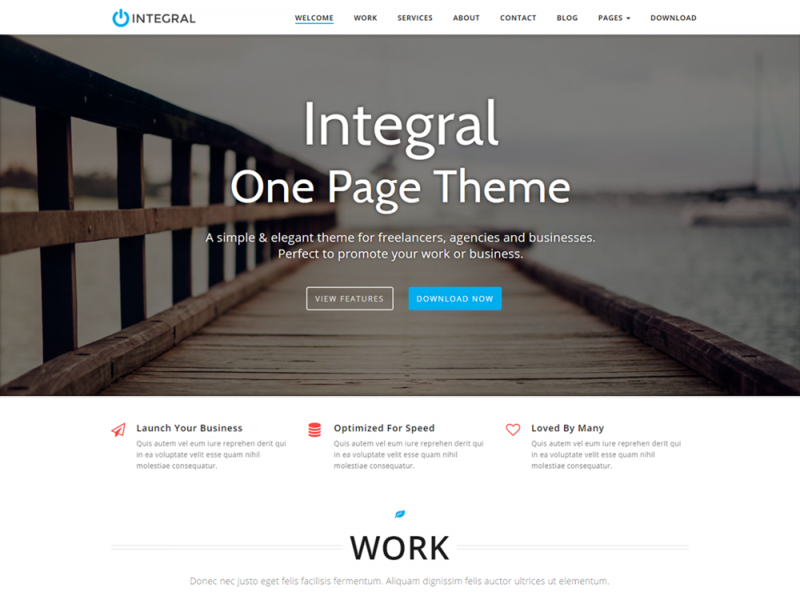 Our list is made up of 10 Multi Purpose Themes that virtually any type of business can use. We hope you find the perfect fit and let us know what you think or, if we’ve missed a really great theme pass it our way and we’ll add it. 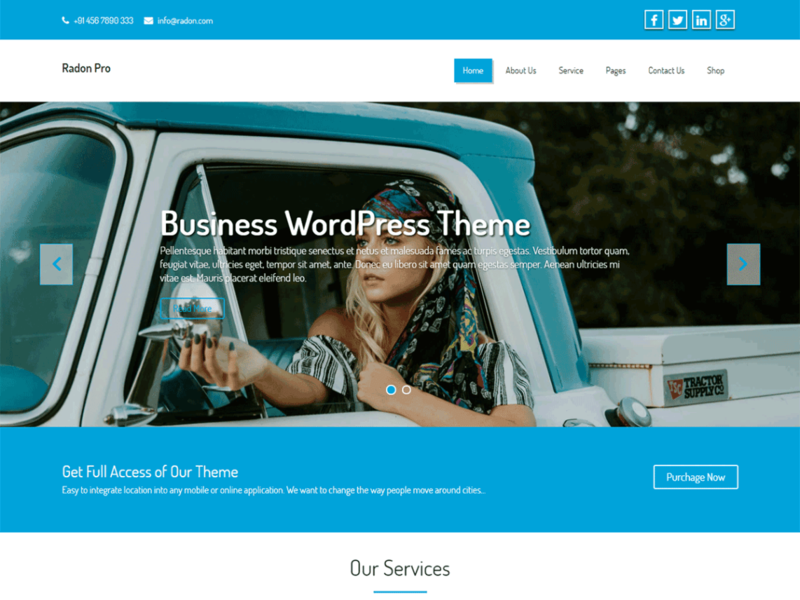 An elegant business theme perfect for professionals and small businesses! Easy Installation & Configuration. The theme welcome page explains how to quickly and easily set up the the theme. With direct links to our support site, we are there to assist you in case you have any questions. Easy Customization. 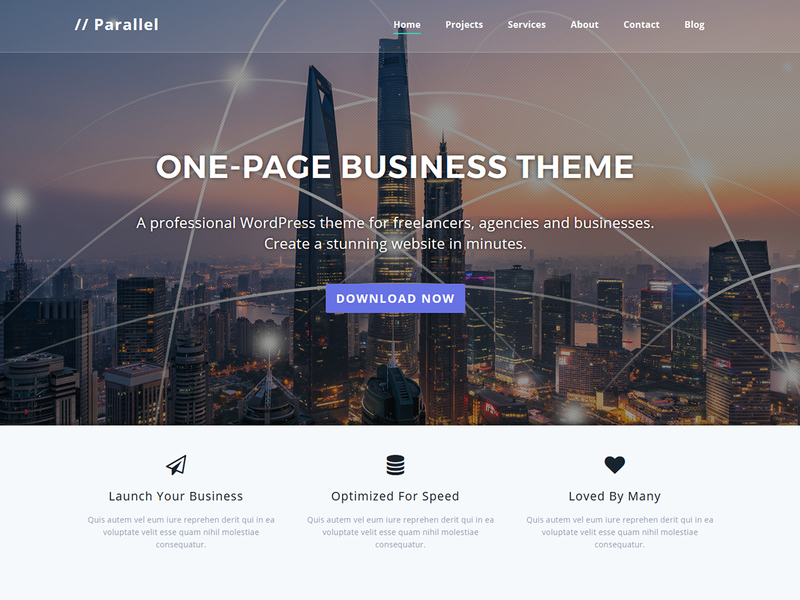 The Parallel Options Panel offers quick and easy customization of all theme settings; colors, fonts, backgrounds, animations and much more. Photo gallery, product showcase, stats counter, testimonials slider, pricing tables, video, call-to-action, map, newsletter sign-up form, contact 7 integration and more. 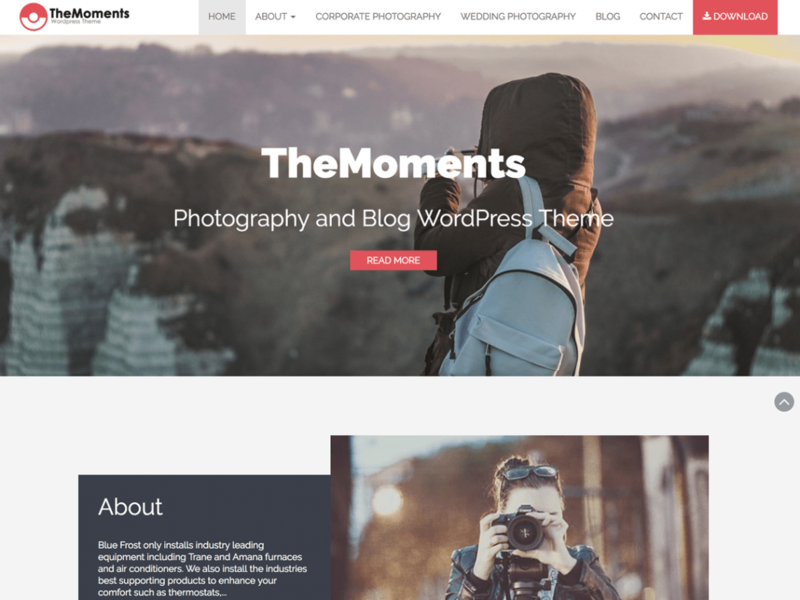 TheMoments photography theme is a minimalist and fully responsive multipurpose theme with full WordPress Customizer integration, enabling you to customize your website with live preview. 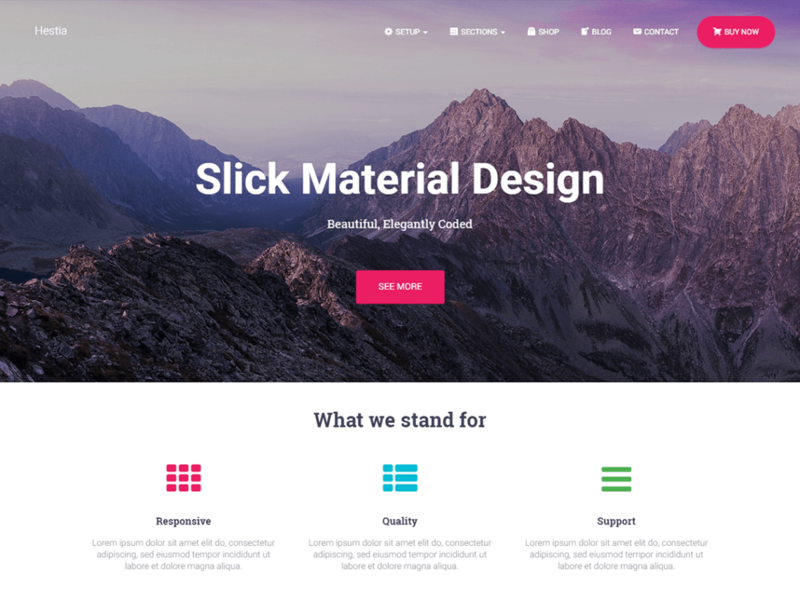 Although bundled with features like homepage banner, featured slider to showcase services and featured posts for blogs and portfolio, this theme is very lightweight. Apart from the aforementioned features, it has widget for instagram, contact form and is built for cross device and cross browser adaptability. 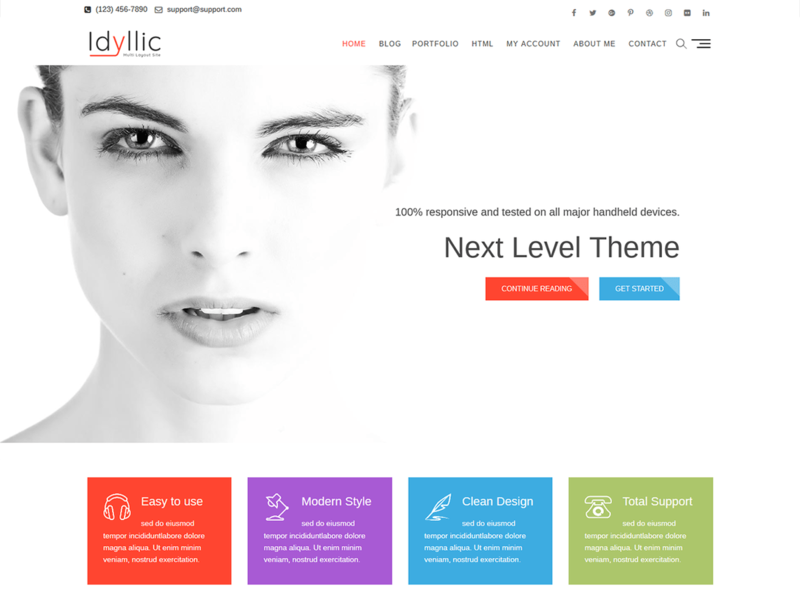 Idyllic is the next generation and Ultra Responsive, Multipurpose, Corporated, Fully Optimized For Agency, Business, Corporate, CV, Personal, Portfolio, Fashion, Fitness, Financial, Ecommerce, Event, Services, SEO, Video and Blog or any other type of business WordPress theme, containing all the features you need to create a stunning website. The theme consists of well organized components so it’s easy to edit and customize everything to create a specific website for your needs. It is designed for Business but this is competent for every kind of site which is designed and developed by Theme Freesia. With a focus on business sites, it features multiple sections on the front page as well as widgets, multiple navigation and social menus, a logo, Color Options and more. This theme supports popular plugins like Breadcrumb NavXT, WP-PageNavi, Contact Form 7, Jetpack by WordPress.com, Polylang, bbPress, wooCommerce and many more. It is 100% translation ready and you can easily customize with lots of options using Customizer. It consists contact us template, gallery template,Corporate Template, widgets and Sidebar. High Responsive – A Free Multipurpose Responsive WordPress theme specially designed to give you an opportunity to create any kind of website you desire, be it a blog, portfolio or a corporate website. This free multipurpose responsive WordPress theme ensures your website is simple, clean and user-friendly. Staying true to its name, High Responsive is completely responsive and comes with features fit for promoting products and services, ability to create a professional portfolio, social media integration and much more. The theme is impressive, aesthetically pleasing and guarantees a superior browsing experience for your page visitors. 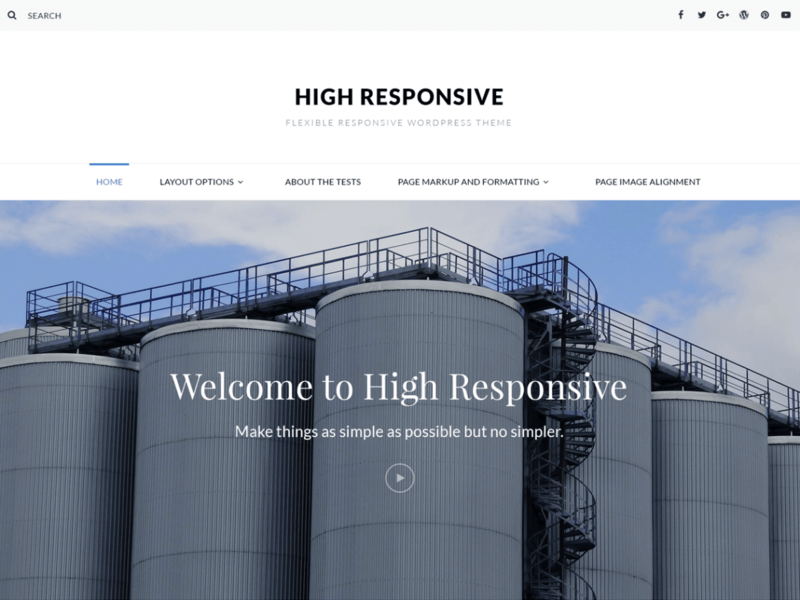 High Responsive is an innovative, simple yet feature-rich free multipurpose responsive WordPress theme that provides a flexible framework for any type of websites with a clean outlook. This theme is translation ready. 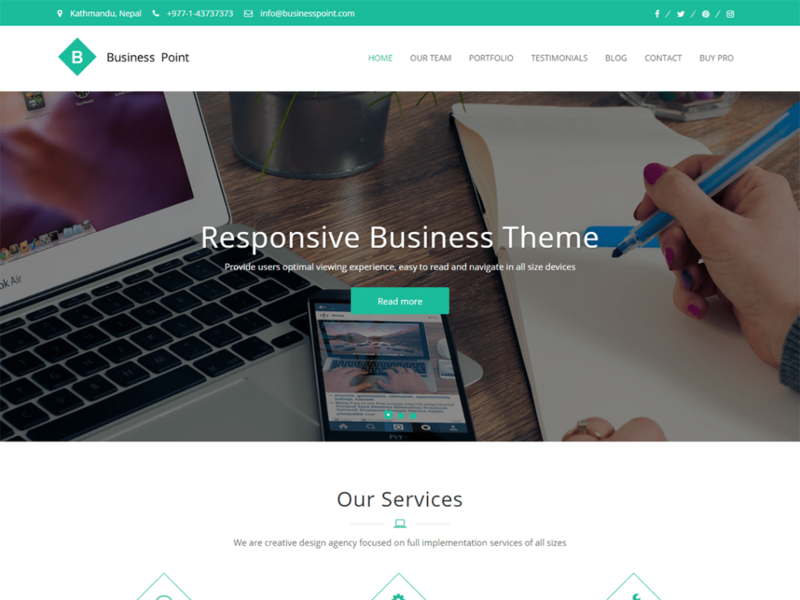 Business Point is responsive multipurpose business theme. It can be used for business, corporate, portfolio, digital agency, landing page, blog, entertainment and all informative websites. It is ultimate flexible with loads of nice options and features. We have applied our best experience so that you can create high-quality websites for business companies of any scale using this theme. 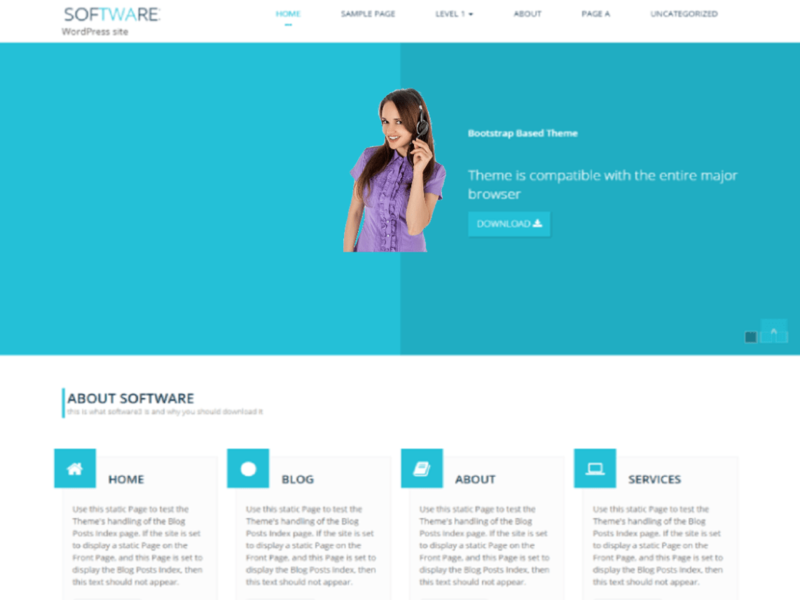 Software is a multipurpose Free WordPress Theme. It consists of Slider, Featured page, About page, Front page. You can choose multiple sidebar option on blog, single post, single page, search page, page not found page as Left Sidebar and Right Sidebar as per requirements. These all options can be optimized from the Theme Options of Customize. RTL Enable/Disable option is also available in Theme Options. What are you waiting for? 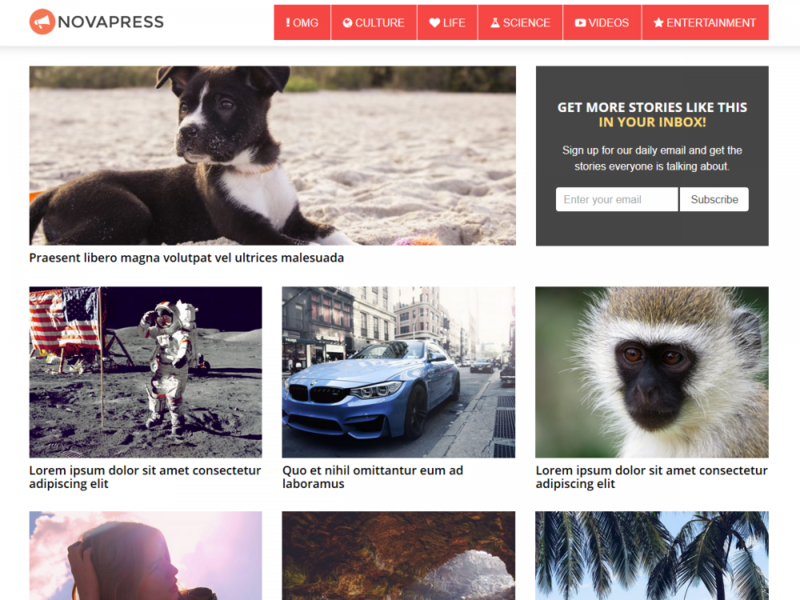 Lets start downloading this amazing and beautiful Free Multipurpose WordPress Theme right away. Radon is a multipurpose business corporate theme. Beautiful design with bootstrap and resposive that support woocommerce with blog left and blog right sidebar. Radon simple, straightforward typography is readable on a wide variety of screen sizes, and suitable for multiple languages. 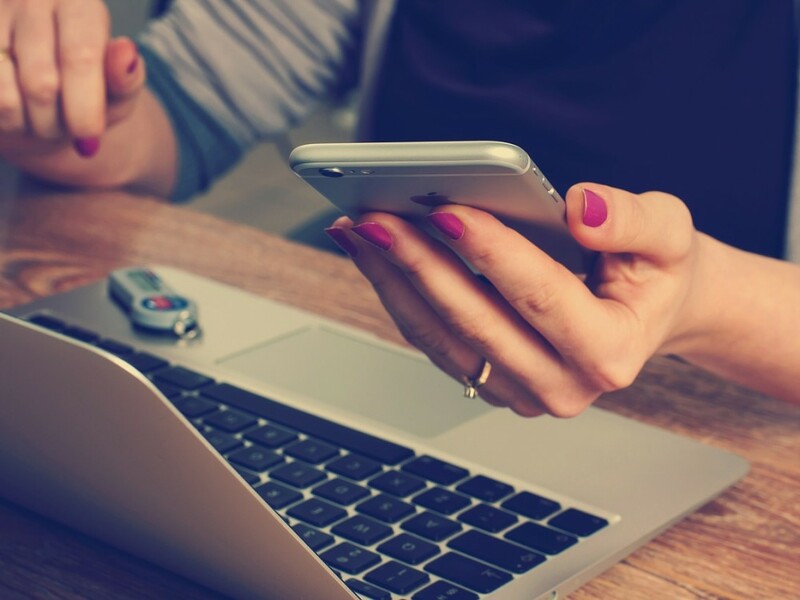 We designed it using a mobile-first approach, meaning your content takes center-stage, regardless of whether your visitors arrive by smartphone, tablet, laptop, or desktop computer. 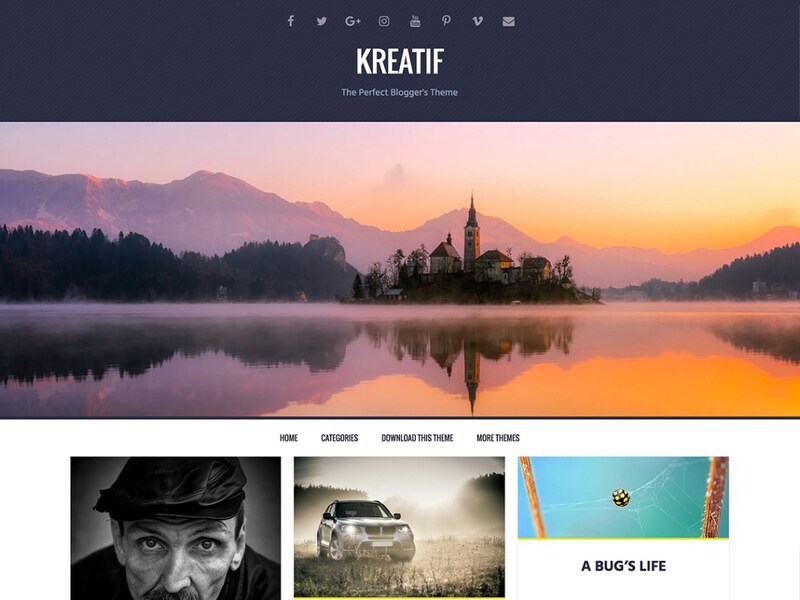 Kreatif is a fully responsive multipurpose theme with some great visuals and dynamic animations to complement them. Also, BX Slider is integrated in the theme for your featured content. kreatif is replete with some pretty good features for your website. Some of those features include Social icon support, Custom CSS, translation readiness and dual menus. Structure Lite is a responsive, multipurpose page-builder WordPress theme with a beautifully minimal design. The theme utilizes the Organic Customizer Widgets plugin to transform the WordPress customizer into a page builder. Use custom widgets within the customizer as content sections to display portfolios, testimonials, pricing tables, team members, featured content and more! Drag and drop the widgets into the desired order on any page. 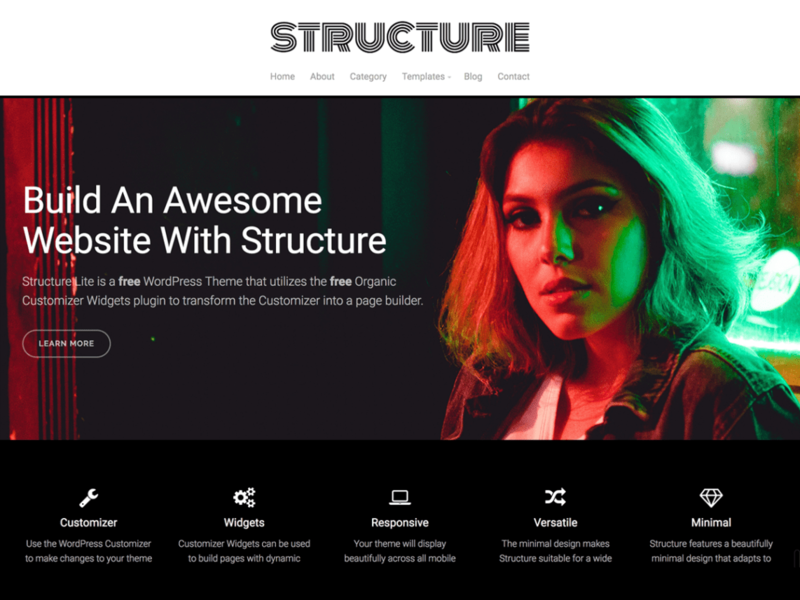 Structure Lite is a perfect website solution for bloggers, writers, designers, magazines and any business that appreciates clean design and typography.